I found this article today: The Flight From Conversation, H/T to Tim Challies. It seems as we continue to become more "connected" we are losing the richness that comes from true connection. Here are some quotes from the article. The thing that I love most about this video is that it illustrates each book highlights the Glory of His Name. Check out 66clouds.com for other data visualizations form the Bible. I have been thinking about the first few questions that we ask the princesses about God.1. Who made you? - God 2. What else did He make? - Everything 3. Why did He make you and everything else? - For His GloryThese three things break down the Chief Aim of Man which is to Glorify God by Enjoying Him Forever.I have had a few chanced this week to talk about this with friends, strangers, an family. It is a difficult thing to wrap your head around. I struggle with it... a lot. The idea that the earth is the Lord's and everything in it, I should be ok when things don't look the way I want.What does it mean to Glorify God by enjoying Him? How does that look? What about my situation?If it is all His, then where do I fit?Those are tough thoughts. What do you think? How do you live a life that shows your absolute reliance on Him?- God's ManPS. I will share my thoughts in the next post. If you have not seem some of this guys other spoken word pieces check these out. 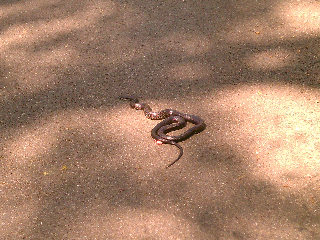 Look what was hanging out in our driveway on Sunday. Luckily for me the Queen and Princesses were in the house when this guy decided to sun himself on the blacktop.